I absolutely love this stroller! It's so easy to fold up and set up. I love that the back wheels are easy to remove with the 1 press button since my trunk is a little small so it still fits! There are only 2 issues I have with it: the first is that the basket under the seat has a very small opening as it doesn't come very far back, the seat sits low so there is very little clearance to put anything in or take out of the basket. The other issue I have is the cup holder/handle. The push handle is so close to the stroller that when you have anything in the cup holders, you can't place your hands on the bar to push like one normally would. I have to put my hands on either side of the of the handle which can be awkward at times. We bought the Aire3 stroller before the first of my first niece. She is using it currently and every time she rides the stroller we can see the joy in her face. But the best part of the stroller is it flexibility to fit in any place and during travelling with your baby, you can always carry it with yourself. I bought this for my first child, who is now two, and I absolutely love this stroller. It's so easy to work with, and so comfortable for your baby. I'm sad that I now need a double stroller. So far I haven't found a double stroller on the same level as this stroller. I selected this for my baby registry and my little one who's almost 4 months old now, loves it. He falls asleep the second I put him in whether I lost the seat back as a "bassinet" or attach his car seat. The only thing I didn't realize when I picked this particular one is that it didn't have a tray for cups and snacks for little ones, it only has the single material cup holder. I went if there's a test attachment I can purchase for when my son is bigger. This is a great stroller and travel system. Love that it can fold down, makes it easy to change my son or even let him sleep. My only disappointment is now that he is older, there is no tray attachment. Also we have lost one of the shoulder strap covers. I'm so glad I purchased this stroller!! There are so many amazing features, the extended sun shade, the full recline, easy to fold and open, smooth pushing. My little loves sleeping in it! I can't say enough good things about it. My mother even loves that she can also open and close it, our old one was tricky with a twist and button and she could not do it. It's lighteright and the perfect stroller to have!!! I recommend it to everyone! Great product!!! This was a replacement stroller from graco. Previously we had the aire 3 and my 1 year old came out the bottom when the button malfunctioned. They sent me this DLX and it's nothing special. Pros..fast fold and lightweight Decent control. Large underbasket. Crazy click on/off cups. Cons..no bar so back to the fear of her rolling out. Stroller gets stuck in closed position often. Gets stuck when we try to recline seat. For some reason graco can't get it right for me. We just need a slightly lightweight stroller with good control, safe for young toddler, nice trays for child and parent. Good control. The aire 3 used to tip..this shouldn't be much to ask. Hopefully they will help us. This was a replacement stroller from graco. Previously we had the aire 3 and my 1 year old came out the bottom when the button malfunctioned. They sent me this DLX and it's nothing special. Pros..fast fold and lightweight Decent control. Large underbasket. Crazy click on/off cups. stroller with good control, safe for young toddler, nice trays for child and parent. Good control. The aire 3 used to tip..this shouldn't be much to ask. Hopefully they will help us. I love everything about this stroller. I was looking for something easy to fold and lightweight with my second child...i have had this stroller for 2 years now and we use it daily and on long strips...its perfect. It maneuvers so fast and easily through crowds. The one hand fold is the best part when I'm juggling the kids. I am so glad Gravo made this awesome stroller...I love the Cup holders and I love that the seat reclines for baby to nap. This product was a gift from my dad and I am so pleased! I searched for weeks for the best click to connect stroller for my needs. I wanted something that wasn't bulky, could house my Graco infant car seat. It is a very light weight model, easy to open and folds nicely. We have used it on several walks and while shopping. The only drawback is the small storage space when the infant car seat is being used. When my son is older this will be a great lightweight stroller. I really didn't need this stroller but I'm so glad I bought it anyway! I have another very similar one from a different brand that was actually more expensive but I wanted a back up stroller. This DLX stroller was very easy to put together. I did it while my one year old "helped" me. It seems very well made and I love how sturdy it feels. It is pretty light considering the size and it does collapse easily. It is very easy to adjust the recline of the seat as well. I am very happy with this stroller. I should've purchased this one first! We purchased this stroller for when our granddaughter visits. It was so easy to assemble (took me about 10 minutes-no tools required), it's light weight and compact when folded, folds/unfolds easily, and maneuvers easily. I particularly like that it has multiple adjustments so I can use now for an infant and all the way through about 5 years of age. So far we have only used for a "test-drive" around the neighborhood but I'm looking forward to many outings to the park, zoo, shopping, etc. i just bought this stroller today and love it already. i have the modes jogger travel system and wanted a smaller stroller for going out shopping and such. very elegant looking, fits great in the trunk and interchanges with my infant seat. I've been using the stroller for almost three months now and my 8-month-old son loves it. He seems very comfortable in it, unlike what I read in some reviews of the product, and he easily falls asleep when on the go. I love the multi-recline feature and I love how easy it is to maneuver. The canopy is huge and has a cool window for the parent to peek in! The only thing I would have liked that this stroller doesn't have is a parent facing feature, but my son doesn't seem to mind that he can't see me. On the contrary, he is really entertained to be looking around and discover new places. I just purchase this stroller and i already love it Its just perfect its small confy cute light weight and it has great details i love how easy i could fold it,also its small but very spacious my son is allmost 3 and he fits great! We received this stroller for our baby shower over a year ago, and our little one is currently 14 months old. Living in orlando, we have annual passes to most theme parks and so this stroller is getting it's work out. The pros are that it folds quickly and easily, maneuvers easily, the basket holds a lot, and I love the zippered pocket near the handles. The only thing that is disappointing us right now is now that our daughter is getting bigger, the clip that holds the seat back up, and lets it recline, is starting to weaken, and so if the baby leans back on the seat, it lays her down. Other than that, this is a decent stroller. We received this stroller for our baby shower over a year ago, and our little one is currently 14 months old. Living in orlando, we have annual passes to most theme parks and so this stroller is getting it's work out. The pros are that it folds quickly and easily, maneuvers easily, the basket holds a lot, and I love the zippered pocket near the handles. The only thing that is disappointing us right now is now that our daughter is getting bigger, the clip that holds the seat back up, and let's it recline, is starting to weaken, and so if the baby leans back on the seat, it lays her down. Other than that, this is a decent stroller. I love this stroller and so does my little girl but after having it for just 3 1/2 months one of the clasps broke. I just bought this stroller becuase its not bulky neither heavy. It's easy to fold and carryed around. Love It!!! Weights Close To NOTHING :) I Had An Older Graco Stroller That Was To Big For Our Little Car & Thankfully This Came Out Right When Our Son Was Born. Id Most Definitely Recommend It. Love It!!! Weights Close To NOTHING :) I Had An Older Graco Stroller That Was To Big For Our Little Car & Thankfully This Came Out Right When Our Son Was Born. I'd Most Definitely Recommend It. We love this stroller! It is easy to use, light weight and fits nicely in our vehicles when collapsed. Perfect for shopping, neighborhood walks and family outings to the park. Easy to maneuver! My 2 1/2 year old daughter enjoys the stroller. Easy to put together and easy fold. Great for a busy mom of two. The storage basket is big enough. Best UsesTrips to the mall, park, walks around the town. Even used it at Disneyland and it was so easy to get around. I bought this product last month and I can't wait to use it for my baby next month. This stroller has many great features. For starters it is so easy to fold up! We also like that we can recline the back to make our son more comfortable. The front wheel can be locked to go straight or unlocked to swivel. The armbar can be taken off so we can more easily buckle our son in. This is definitely one of my favorite strollers. The movement on this stroller is easy to control. I have taken it off road, over grass, and across sidewalk and it moves along them all well. The click connect feature made it easy to quickly attach my infant car seat and get where I needed to quickly. I picked the grey and teal color seat so it wouldn't trap to much heat. Although I felt the design was very dated and basic. This stroller was a little heavy and bulky in comparison to a space saving umbrella however, as noted previously the larger tires and design made most locations accessible. I overall am happy with my purchase. We bought this stroller about four months ago and I have been very satisfied with it. It is easy to push and the sun shade comes down very far! It lost a star rating because the basket under it is a little tight and doesn't accommodate most items (not that big of a deal since we have downgraded our diaper bag), and it doesn't come with a tray. We no longer have need for the click connect feature and would really love if it had a tray for the baby that could be put on now. I really like the fact that this came with all the accessories you need. The wheels are sturdy and easy to maneuver. It also folds up so easily and is lightweight! I love that this fits my car seat AND comes with a seat for her. So many options, so many ways to face her, and it reclines--I really love this seat. I put it together a while ago because I read that strollers can be difficult to put together but this was really easy to assemble and figure out. The one thing I can't quite figure out is how to insert the car seat with the toddler seat in it--but I guess I don't even really need to do that. Collapses easily, car seat inserts easily, really love this stroller. Well worth the money. It is quick to setup and easy to navigate. The click connect feature works great and is very useful. Just bought this stroller because we needed something less bulky and that folded down flat. This stroller is the perfect height for optimum comfort pushing it, lays flat, glides easily and is very comfortable for our 1 year old. I've had this for a few months now. Love the bassinet feature! It's super easy to open and close. The ride is so smooth and maneuvers very well. Everyone who pushes the stroller falls in love! Have been using this stroller for about 2 weeks and so far it's great. I'm 5'10" and this stroller is nice and tall, very easy to fold and open, stands on its own so the handle isn't always covered in dirt, steers really easily with one hand, brakes are easy... only things I would change is that the basket isn't as large as my last stroller, and the cup holders are a little shallow. But would def recommend it overall. This stroller is 20 lbs, folds with one hand and stands upright when folded. It seems easy to maneuver, sturdy and good for walks and traveling. We bought this as new parents and love that we can use the carseat for over a year and the stroller for years to come. It makes sense financially and the storage and convenience of the stroller is unmatched. Great stroller for a good price. I did a lot of research before deciding what stroller to buy. And I'm glad I chose this one! Lightweight, easy to fold/unfold, easy to maneuver one handed, and doesn't take much space in my car's trunk. Great stroller for a good price! I bought this about 2 months ago, and I love it! Easy to use and the wheels in the front don't give me problems, like other strollers did with one wheel. It folds in seconds and with little effort, provides great comfort and support for my son, and it doesn't weigh so heavy! Another feature I love is that it can also fit a newborn without a car seat, and folds to cover his feet to keep warm and for protection. Above all, love the design and would definitely recommend this stroller! My wife and I just recently had a baby daughter and wanted to start taking walks. We bought this stroller to go with our carrier and it works perfectly. It is easy to use and push. The fold up strap makes it easy to make compact. 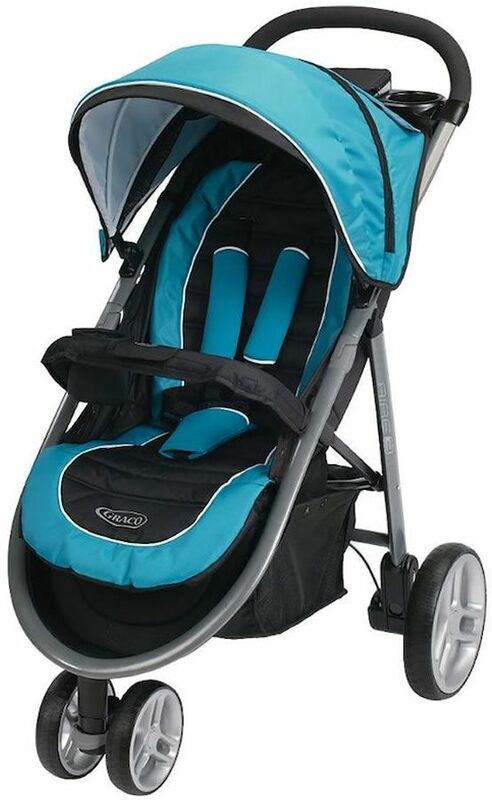 We really enjoy this stroller and would recommend getting it if you have a click connect carrier. I bought this stroller a year ago and i am very happy with my purchase. It is very compact easy and light to move around. wish they made a double stroller aire3 connect stroller. Graco's Aire3 Click Connect Stroller is designed to make it extra-easy for you to explore with baby. The sleek, lightweight stroller weighs less than 21 lbs., so it's easy to lift and carry, and the 3-wheel design is easy to maneuver. It folds with one hand and automatically stands for simple storage. The multi-position, flat-reclining seat is comfortable as your child grows. A parent's tray with zippered storage and two cupholders, and an extra-large storage basket makes strolling more convenient for mom. It accepts a all Graco SnugRide Click Connect Infant Car Seats with a secure, one-step attachment.